In this tutorial we used an image with 400px width and 350px height. You can use any dimensions and replace the same in the CSS by just replacing all occurrences of 400px and 350px with your image’s height and width. Upload your images on Weebly code editor under “Theme > Edit HTML/CSS > Assets” and the file path of an uploaded image will be like: “http://yoursite.com/files/theme/image.jpg”. You can also use images from other sites or from other pages on your Weebly site by directly using the the image URLs. The widget has four elements as shown below and has 8 different styles of transitions. Below is the complete CSS which needs to be added under “Header Code” section of your Weebly page . The image is placed inside a panel (.panel) with the same dimensions of the image ( 400px x 350px). The overlaying slider (.overlay) is created with CSS transition along with cubic-bezier() function. 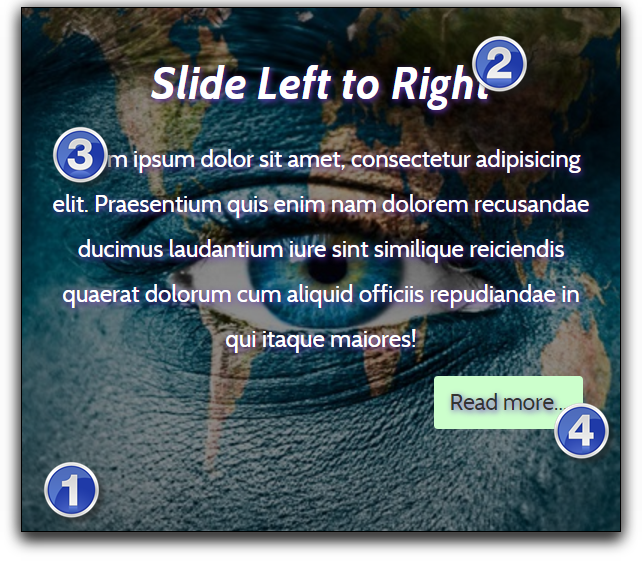 The overlaying slider has elements – title, description and a button (.heading, .desc and .btn). 8 styles with the classes – .left, .right, .top, .bottom, .top-left, .top-right, .bottom-left and .bottom-right. Each style has a hovering effect with corresponding classes like .panel:hover .left, .panel:hover .right, etc. Add the below HTML inside an “Embed Code” element on your Weebly page. Each style has an inline image used as a background which you can replace with your own URLs from step 1. If you want to only use certain styles then use only that corresponding code block. In case if you want to use the overlaying effects on images throughout your site, then place the CSS code inside the “Header Code” section of your site under “Settings > SEO > Header Code” section. Or you can add the CSS under “main_style.css” file without the <style>…</style> tags. Now the HTML code block can be placed on any of your Weebly pages. For example, you can use “left to right” style on page1 and “bottom to top” style on page2. After embedded the code, the images on the editor may look scrambled but the published site will have proper display of images with overlaying effect.